Se você está com pouco tempo, mas quer ver o melhor da Romênia, faça um tour privado de três dias. Você explorará Brasov, o Castelo de Drácula e muito mais com um guia particular. Além de duas noites de hospedagem em um hotel de quatro estrelas, você também desfrutará da conveniência do transporte de ponta a ponta, das taxas de entrada incluídas e de um jantar de três pratos. A excursão termina com um confortável passeio de carro de Bucareste e o desembarque no aeroporto. Excellent trip! We really got the full package of wonderful trips, accommodation and transport and Adrian our local guide and driver was fully experienced and knowledgeable about everything there was to know about the area's history, nature, and hospitality. Our guide Adrian was superb. He told us more about Romanian history and culture than we had ever wanted to know. But strangely, it left us wanting to know more. He took us to experience local restaurants, featuring local cuisine and musicians who played songs just for us. We toured Bucharest, Romania's capital city, including the massive Palace of the Parliament. In the countryside we toured a fortress dating back to the 12th century. 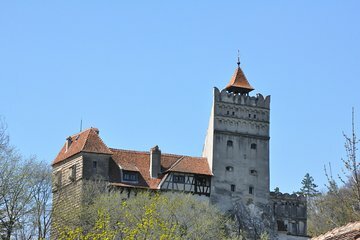 Bran castle-Dracula's castle- in Transylvania was wonderful. Adrian walked us past a very long line of people waiting to get in, making us feel like rock stars. The hotel Acasa la Dracula was excellent and so was the restaurant at the hotel. We walked through the town square in the town of Brasov and Adrian took us to the Black Church, a very ornate church dating from the 1400s. The four of us took this tour for Dracula's castle, but we fell in love with Romania and want to go back.